Falesia Hotel - Adults Only Surrounded by large gardens, this hotel offers a free shuttle service to Falesia Beach, a 5-minute drive away. Every room has an LCD satellite TV and free WiFi access. In the summer, the Show Bar offers live entertainment, and the Palm Bar offers cocktails in the garden..
Grande Real Santa Eulalia Resort & Hotel Spa price per day from € 104 Grande Real Hotel is situated only 4 km away from Albufeira. Grande Real Santa Eulália features 4 outdoor pools as well as a hot tub, gym and sauna. All of the contemporary rooms are air conditioned and include satellite TV and a balcony..
Porto Bay Falesia price per day from € 114 This hotel features private access to the white sandy Falésia Beach and 2 restaurants. Porto Bay Falésia is just few minutes’ walk from the eateries and bars of Olhos de Agua. 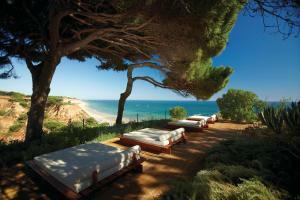 Guests can choose several beauty treatments, including reflexology and aromatherapy..
Sheraton Algarve Hotel This 5-star hotel has a stunning cliff-top location above Portugal’s longest beach, Praia da Falésia. It features luxury spa facilities, 4 restaurants and a full-service Water Sports Centre. Most units also include furnished balconies with garden or sea views. 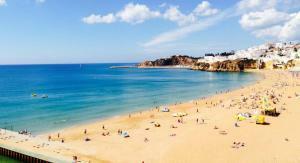 Clube Maria Luisa price per day from € 23 This beach front resort on Albufeira’s coast is located on a small cliff overlooking Maria Luisa Beach. It offers a swimming pool and self-catering accommodation. Guests of the Clube Maria can enjoy refreshing drinks and light snacks at the bar, or by the pool, which is surrounded by sun loungers..
Vivenda Sacramento Located in a tranquil residential area 2 km from Albufeira Marina, Vivenda Sacramento is a villa with 4 bedrooms. 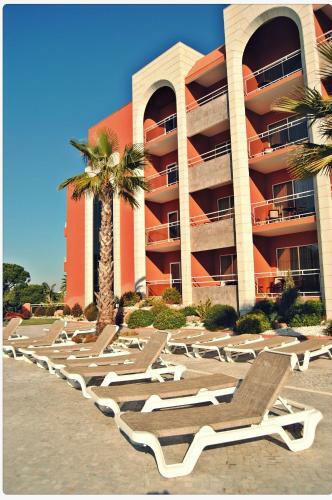 There are barbecue facilities outdoors, and the kitchen is fully equipped to prepare meals. São Rafael Beach is 2 km away from Vivenda Sacramento, and Pescadores Beach is 15 minutes’ driving..
Apartamento Alto do Moinho Offering an outdoor pool, Apartamento Alto do Moinho is located in Albufeira. There is a full kitchen with a dishwasher and a microwave. You can enjoy sea view and city view from the property. Vila Joinal price per day from € 36 About one km from Castelo and Evaristo Beach, Vila Joinal offers bright duplex villas surrounded by landscaped garden and lush palms. 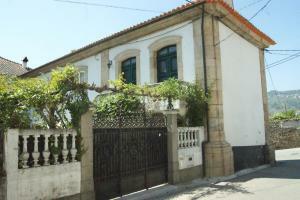 Vila Joinal is completely fenced and young guests can have fun on the playground, or enjoy the children’s shallow pool. 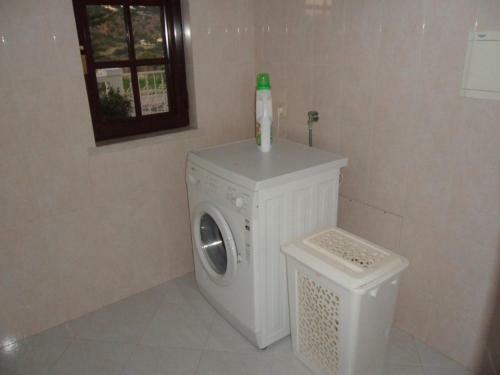 Faro Airport is about 30 km away, and the Vila offers free private parking on site..
Rich & Poor price per day from € 76 Each private or shared bathroom comes with a bath or shower. Other facilities offered at the property include a shared lounge, a ticket service and a tour desk. 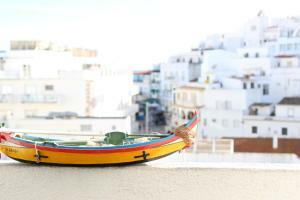 The hostel is 700 metres from Old Town Square, 300 metres from Fisherman's Beach and 2 km from Albufeira Marina..
DU4ARTE hostel price per day from € 18 Located in the heart of Albufeira, DU4ARTE hostel is just a 2-minute walk from well-known beaches like the Pescadores and Peneco. 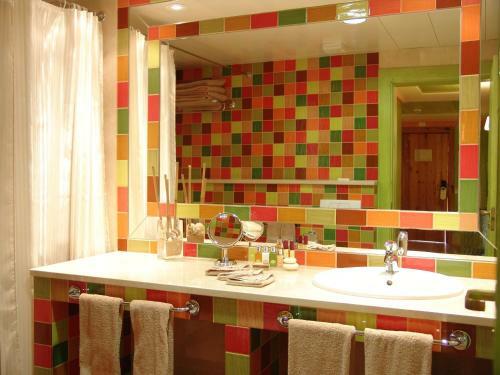 Each room is equipped with a TV and daily cleaning is provided. There is a shared kitchen where guests can prepare their own meals..
Villa Paraiso price per day from € 120 Villa Paraiso is located in sunny Algarve and features a garden and outdoor swimming pool. There is also an equipped kitchen and outdoor barbecue facilities..
Poco V7 4 km from the beach and 6 km from the Albufeira centre. 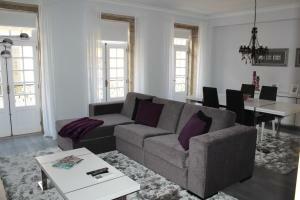 The ample villa has an outdoor swimming pool and a games room with billiards. Free WiFi is provided and there is a full kitchen, as well as a dining area. Guests may cook their own meals in the kitchen, enjoying them in the dining area..
1. Head northwest on Beco França Borges toward Rua Horta Machado. 2. Turn left onto Rua Horta Machado. 3. Rua Horta Machado turns slightly right and becomes Rua Cruz das Mestras. 4. Turn right onto Rua do Alportel. 5. Turn left onto Rua Aboim Ascensao. 6. At the roundabout, take the 1st exit onto Largo de Camões. 7. At the roundabout, take the 2nd exit onto N125. Go through 1 roundabout. 8. At the roundabout, continue straight onto IC4. 10. Turn left onto EM526. Go through 1 roundabout. 11. Continue onto Estrada de Vilamoura. 12. Continue onto EM526. Go through 1 roundabout. 13. At the roundabout, take the 2nd exit onto Av. dos Descobrimentos. 14. At the roundabout, take the 4th exit onto Rua de Dunfermline. 15. At the roundabout, take the 1st exit onto Av. Infante Dom Henrique. 16. At the roundabout, take the 2nd exit onto Rua Do Oceano. 17. Turn left onto Travessa Do Oceano. 18. Turn right onto Rua José Vasconcelos e Sá. 19. Take the 1st left toward Rua Bairro dos Pescadores. 20. Turn right onto Rua Bairro dos Pescadores. 21. Take the 1st right onto Rua das Telecomunicações. 22. Take the 1st left onto Rua Fernão de Magalhães. 23. Turn left onto Travessa Fernão de Magalhães. Destination will be on the right. Golf club Oceanico (Victoria), 9.6 km from the centre of town of Albufeira. Golf club Oceanico (Old), 12 km from the centre of town of Albufeira. Golf club Vale do Lobo (Ocean), 17.2 km from the centre of town of Albufeira. Golf club Vale da Pinta, 20.7 km from the centre of town of Albufeira. Golf club Quinta do Lago (North), 20.9 km from the centre of town of Albufeira. Golf club Quinta do Lago (South), 21.2 km from the centre of town of Albufeira. Golf club San Lorenzo, 22.2 km from the centre of town of Albufeira.